We are the leading live events association with a vibrant chapter focused on building meaningful relationships through networking, inspiring education and professional development opportunities. Our vision is to be a collaborative resource and the largest, most influential voice in the Northern California Live Events community. What is ILEA Northern California Chapter (NCC)? ILEA stands for International Live Events Association, and we are one chapter in the Western region, who functions as part of ILEA International. ILEA-NCC is a community of Northern California event professionals who come together to network, build relationships and essentially help each other's businesses grow. 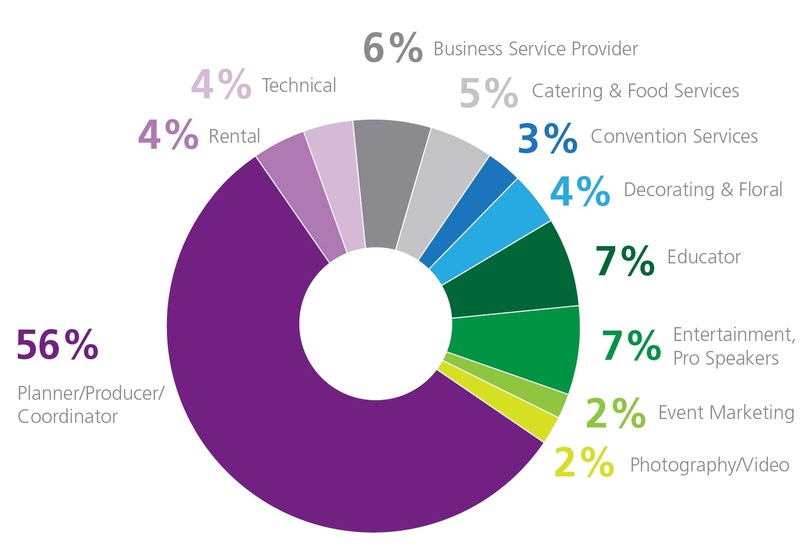 Our members come from a variety of event industry backgrounds including special event producers and planners, caterers, designers, florists, destination management companies, rental companies, tent suppliers, educators, entertainment companies and many more. It is the perfect organization to join if you are currently a creative events professional or you are excited to learn more about the industry! Interested in becoming a member? Join our NCC community today! ILEA is comprised of over 2,800 professionals in 27 countries representing the events industry. Click here to learn more about the ILEA story and see the chart below to see who our members are as a whole ILEA organization globally. ILEA-NCC is committed to providing a safe and enjoyable event experience for all event participants, and a welcoming environment for free discussion of ideas. We do not tolerate harassment of event participants in any form. Harassment includes—but is not limited to—unwelcome conduct or offensive verbal comments related to gender, gender identity, gender expression, sexual orientation, age, disability, physical appearance, body size, race, national origin, or religion; deliberate intimidation, stalking, following, unwelcome or unauthorized photography or recording, sustained disruption of talks or other events, inappropriate physical contact, and unwelcome sexual attention. Similarly, encouraging others to engage in such behavior is not permitted, nor are false accusations of harassment. Who is covered under this Code of Conduct? All attendees, speakers, sponsors, exhibitors, staff, and volunteers at our events are required to refrain from harassment. ILEA NCC staff will enforce this Code throughout the event, and expects cooperation from all participants. ILEA NCC expects sponsors and exhibitors to avoid sexualized images, activities, or other material. Booth staff (including volunteers) should not use sexualized clothing, uniforms, or costumes, or otherwise create a sexualized environment. ILEA NCC also requests that event participants refrain from using potentially offensive language in social media posts using our event hashtags. Speakers are responsible for the content of their presentations, but ILEA NCC requests that speakers be cognizant of potentially offensive actions, language, or imagery, and that they consider whether it is necessary to convey their message. If they do decide to include it, ILEA NCC asks that they warn the audience, at the beginning of the talk, and provide them with the opportunity to leave the room to avoid seeing or hearing the material. How should I handle an uncomfortable situation at an event? Interpersonal Behavior: If it is safe to do so, we encourage you to request that the person stop the unwelcome or harassing behavior. Participants who are asked to stop any such behavior are expected to comply immediately. If you are being harassed, notice that someone else is being harassed, or have any related concerns, please contact ILEA NCC Headquarters immediately. Talks and Presentations: ILEA-NCC staff and event organizers welcome comments of all kinds about talks and presentations. Attendee comments are taken seriously when planning future events and will be kept in confidence if requested. Interpersonal Behavior: If an incident of harassment is reported, ILEA NCC staff will conduct an investigation. If they determine—to the best of their ability, and in their sole discretion—that a participant has violated this Code, they may take any action they deem appropriate, including warning the offender or expulsion from the event with no refund. Under certain circumstances and at their discretion, ILEA NCC staff may contact hotel security and/or local police. To protect all parties involved, ILEA NCC will generally not make any detailed public statements about Code of Conduct incidents. Sponsor/Exhibitor Complaints: ILEA-NCC staff will investigate the complaint. If they determine—to the best of their ability, and in their sole discretion—that action is warranted, they may resolve the matter as they deem appropriate, including removing the exhibit. Talks and Presentations: Concerns will be relayed to current and future organizers, who will take the information into account when selecting speakers for future events. ILEA-NCC requests that attendees understand, however, that determining whether material is “offensive” is a subjective call.